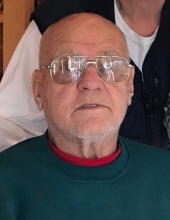 DETROIT-Elwood Leroy Sinclair Jr, 87, lovingly called Jr, died peacefully on Friday, March 15, 2019, at Togus. Should friends desire, memorial donations may be given to the Burns W. Knowlton Post 32 American Legion, c/o Gary Jordan Sr, 260 Corinna Road, St. Albans, Maine, 04971, in Jr’s memory. To send flowers or a remembrance gift to the family of Elwood L. Sinclair Jr, please visit our Tribute Store. Guaranteed delivery before Elwood's graveside begins. "Email Address" would like to share the life celebration of Elwood L. Sinclair Jr. Click on the "link" to go to share a favorite memory or leave a condolence message for the family.